Are you finding it difficult to step away from the Olympics and do anything else? I love the skating in particular and can watch it hour after hour! I think I must have been part of an Olympic ice-dancing couple in a former life. Oh, hahahaha, the very idea! I did roller skate as a kid for a short time, but I never ice-skated. Poor Mister tried to teach me to ice skate back in the glory days of our dating. Back when he didn't have to worry about a hernia from picking me up when I fell. And fall I did, again and again! I'm not saying I did it on purpose to have him put his arms around me to help me up. Okay, yes, I'm saying it. Using an MFT die, I cut a rectangle frame from a stamped musical background stamp from SU. 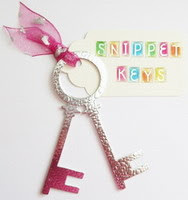 The NBUS "Elegant Musical Staff" is from Poppystamps. This QACAS design was specifically made to help Less is More celebrate their 7th birthaversary!! Congratulations, ladies, and here's to many more!! made this card perfect for the photo inspiration at TIME OUT Challenges! A deep red coral embossed panel made a fun background for the splattered (but intact) heart from Concord & 9th. 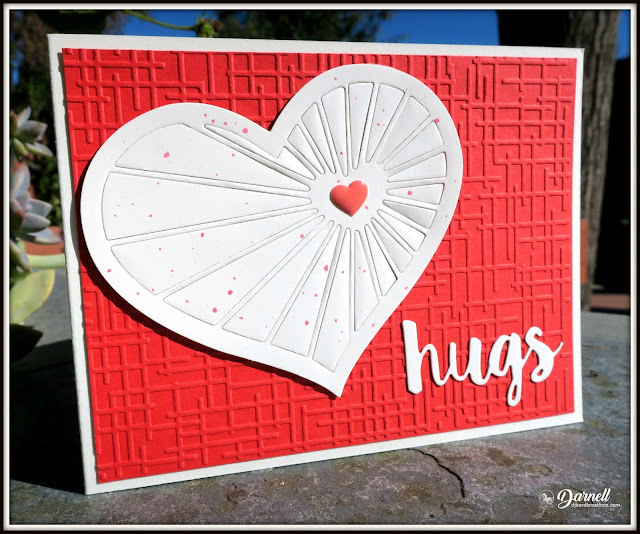 A simple card filled with love and hugs! Happy Valentine's Day tomorrow!! Die Cut Divas: Love is in the air! Moving Along With the Times: Love. To open the pop-up comment box that let's you jump to the end w/o scrolling: Click CTL + Home. 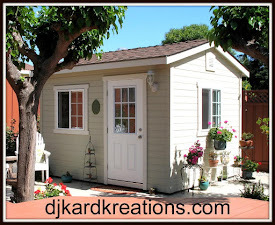 Click the Home tab under my blog banner which resets the post. Click page down to reach the end of the post. Click Comments and the pop-up box opens. Click "Jump to Comment Form" and wallah, no more car pool tunnel! Mwah! p.s. If you ask me a question in your comment, please remember to leave me your email address so I can respond. Thank you! p.p.s. Did you notice one of the frames of the musical cards is upside down?! I know nothing of musical notes and they all looked every which way to me! I paid attention with the second card and noticed the cut-out part had numbers on it, so I know that the second gold card is right-side up! You are showing beautiful cards today! And yes: I also like watching ice skating, and I am a fan of figure skating since my childhood. But instead of figure skating speed skating is huge in Holland and untill this moment we already won 3 gold, 2 silver and 2 bronze medals! The newspapers are colouring orange (our national colour) and I think there will be more successes in the next days. Hi Darnell, All three cards are lovely. My dad use to speed skate on the fens. My brother skated, but mum and I never got it. Think we bnoth suffered from the same lack of balance..
Wow these are such beautiful cards! Popped across from LIM to admire your music card only to find two there AND a smashing heart themed card too - you're on a roll matey! Love the border of your first card and oh that heart die is beautiful! Awesome cards!! Love that gold musical staff! Wonderful cards, Darnell. 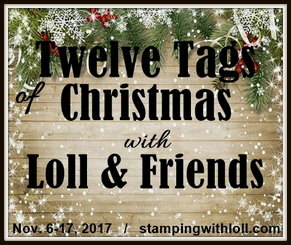 Love the music ones, since I have two girls involved in Band and they point out all music type stamps when we shop together. They can read the music, I cannot. LOL I really like the heart one, too. So pretty. I've been watching a lot more of the Olympics than I normally do in the winter. I do love the ice skating. Thanks for sharing your sweet story. Have a happy week! Hugs! The music theme is fantastic! Love your cards! And yes, I am watching rather a lot of the Olympics! Two gorgeous cards Darnell, I especially love the music themed one. All beautiful cards, Darnell. Feel so honoured you pulled yourself away from the olympics to create your fabulous music cards! Super CAS design with all that luscious white space. Love how you changed it to fit the TO photo challenge too. Enjoy the olympics and thank you for celebrating with and joining us at Less is More. Beautiful cards. Love the treble clef and notes. The heart is very pretty against the nice EF. I tried ice skating..........ONCE. In Florida there's not much opportunity to get good at it. Three fabulous cards Darnell...love the music ones and the last one has used my all time favourite heart...all intact...now why didn't I think of that. Happy Valentine! Wow Darnell what three fabulous cards, I especially love the musical themed ones and the heart card is wonderful with that bright embossed background, just lovely. The musical background is fabulous!! I love both colourways for the focal images. As for the heart card, that coral colour is fast becoming my favourite colour at the moment, it is just so wonderfully cheery! Love your bold CAS sense of design! Both cards are marvelous. So glad you joined us at Die Cut Divas. Wow!! Two striking cards!! Such fabulous designs!! as always your card are so excellently crafted. Love them all they are so super and gorgeous. The second appeals to me the most with the gold die cut as I am blingy type of girl, sure I was a magpie in another life. Your heart one is so beautiful and the embossing and heart is stunning. Yor cards have just given me an idea for the Twofer hopefully. Music and hearts...what could be better considering cupid is flying around here with his quiver of arrows. Those clef cards are CAS perfections and that giant, luscious heart is beautiful. i love both of your cards. Keep inspiring me. I might get in the mood to create again soon. LOL But maybe we need a break now and then. Oh my I would have to close my eyes and pick my favorite- but I think it is the second one with gold embossed treble cleft. (I played piano until a few years ago when I had a 4 wheeler accident and broke my arm in several places) and now I just don't have the flexibility to play the piano anymore. But oh I can still stamp. Loving the Olympics - so far I have really enjoyed the snow boarding - talk about having no fear. Three fantastic LIM cards, they look very classy. Gorgeous cards, as always Darnell! I do live the heart of strings one of course - I adore that die yet keep forgetting to use it! I only really make cards with hearts on for Len each year - ought to think about your challenge really but am limiting my time at the desk a bit. You and me both, Darnell - the Winter Olympics are mesmerizing, the figure skating in particular. I did ice skate as a kid in Toronto and even took a year of figure skating lessons - I think I'd fall flat on my bottom if I tried any fancy stuff now but I do still like to skate. I've been watching so much of the Olympics that I think I've turned into an addict and don't want to do anything else, though I do make myself put together the odd card or watercolour an image (but only during the boring bits). Almost posted this without commenting on the cards - love the musical ones, especially the second one with the gold - it's such a perfect take on the inspiration photo. And the heart one reminded me that I have to tear myself away from the TV and get my Twofer hearts made! Those music themed cards are terrific, Darnell. Perfect for any occasion it appears. The embossed red background is one I've never seen before and I love it's graphic nature. Love that music die, Dolly! It's especially musical in the gold! Love that fantastic heart too. I need to get some cards posted using that die! Love the simplicity of your designs Darnell, but they still pack a big PUNCH!! Terrific cards!! 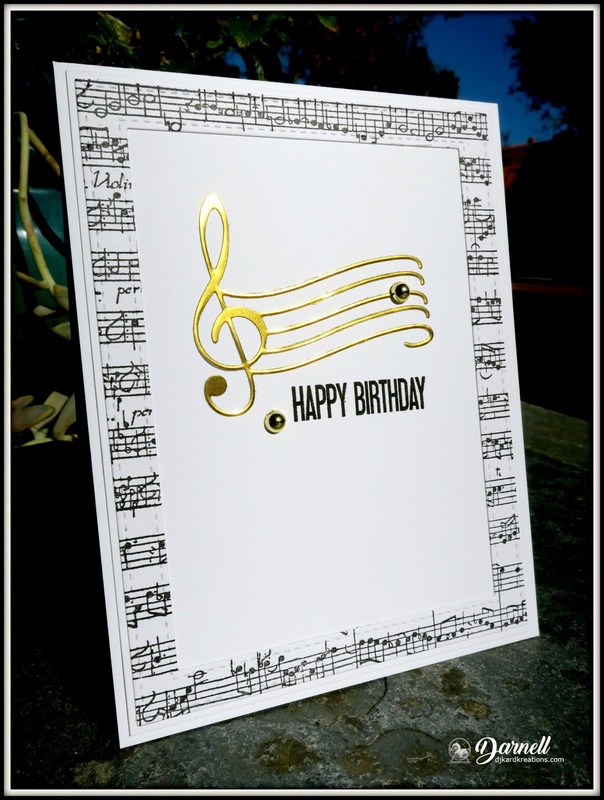 Beautiful cards Darnell!I love the music card..the gold is so striking! Love all 3 ca dos...but the music cards really make me say WOW! I might even have to CASE them! Awesome cards today. The musical staff die-cut is so versatile. It could definitely also be used for anniversaries, weddings and just-a-note cards. Your intact heart with splatters looks so pretty, and I love the coral color of your embossed background. Wonderful cards Darnell! Love all the hearts. I too am in Olympic thrall...all through the night sometimes til past 7 am. It's only a bit more than two weeks right??? What a stunning trio of cards ..... I like the music die! Great cards considering you only had the TV comercials to make them in. I did make the one valentine card for yours truly and that one nearly did my head in working out how to do it. Hugs Mrs A. You just crack me up Darnell... Love the ice skating story, you vixen you. I LOVE the second take with the gold and how well it goes with our inspiration photo. Thanks so much for playing with us at ime Out! I'm late by visiting your blog. But I have to say, I like to watch ice skating to. :-) I'm admiring your simply and powerful design of LIM birthday card and beautiful Valentine card. Your musical note cards really strike a cord with me, Darnell - pun intended. The large note is a real standout. I love the background. Your heart card is fabulous. I ice skated only once. It was way too cold for me. Your story of why you fell so much cracks me up!! I could barely roller skate (no coordination!) but I enjoy watching ice skating. sorry no Olympic viewing however...Love both colors of your CAS music design, it packs a lot of interest with the fab die. The coral background on the sunburst heart design is a big WOW and is anything but a 'simple' card! Love all the dimension and warm color. TFS & Hugs. That is such an elegant treble clef and staff in both black and gold! The heart with its spattered rays is gorgeous on the embossed coral cs! I used to enjoy both roller skating and ice skating back in the day, but I could never imagine twirling or leaping into the air let alone at the same time! These are great, Darnell! I love the music card, so eye catching with the stamped background but still really clean and crisp... perfect! And the bold heart card is fabulous <3 Thanks for sharing! Two lovely cards. 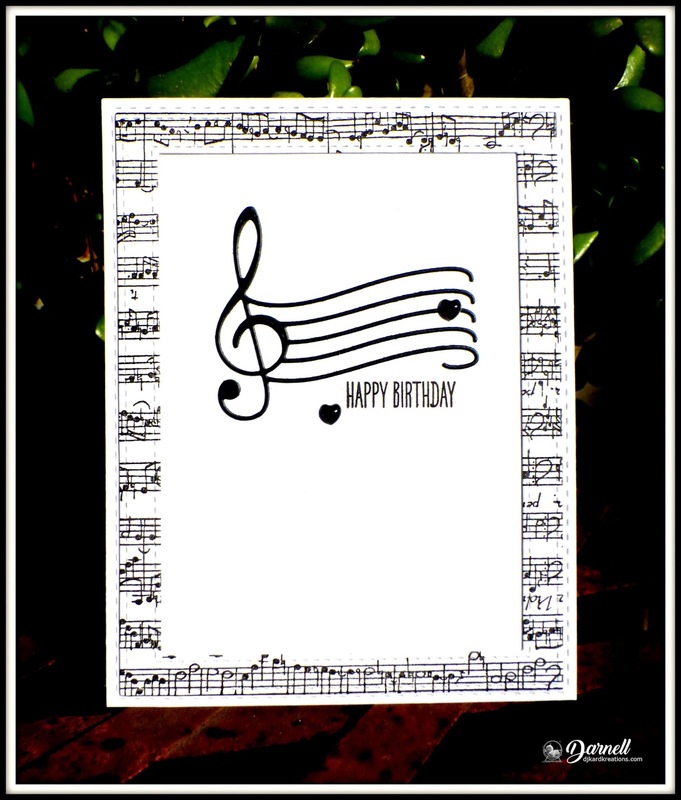 I loved the musical notes Birthday cards. I have a musical notes die but never thought to combine it with musical score paper. Fabulous idea. The second card is so pretty. A heart full of love. 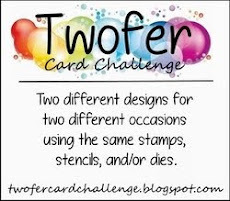 Must run and get to work on my twofer cards! So glad Hammy got you out to the Playhouse as you've made wonderful card, Darnell! I love both of the music bg cards, but am especially drawn to the one with gold! The C&9 heart die is so wonderful--may end up "having" to get it & I love the look with all the pieces kept & the splatters! Great embossed bg, too! Three lovely cards. Love the gold on the second one. Umm cough cough I must be the only person on the planet not watching the olympics. Sorry my tablet keeps freezing Darnell, I wanted to add that the music card looks so different once you added gold to it, I love it! More awesome cards! Love the musical birthday cards - super pretty. Fun heart card too. I am not keeping up too much with the Olympics but when I do - there are some magical stories there! Love your musical cards and did not notice that one frame was upside down until you mentioned it! Love the splattered heart in front of the embossed panel! I'm pretty much in LOVE with those first "musical cards"! Wow! So pretty!!!! Love the heart card too of course. Wonderful Musical notes cards, Darnell! I Love the background stamp that you cute to use it as a frame~very cool idea. The Valentine is beautiful also. You certainly know the score..........boom boom!!! This would be perfect for a friend of mine who sings in a choral society. I made her something similar last year as a good luck card for her concert. You have reminded me that I haven't blogged it yet lol!!!. You are loving your hearts at the moment.......love must be in the air.